One of the most elaborate houses in Herculaneum, the House of the Stags was designed to make the most of its sea views. Situated in Insula IV, cardo V, the House of the Stags is a high status Roman Villa in the Roman seaside town of Herculaneum. Named after the marble statues found in its peristyle garden, it was extensively remodelled before the eruption of Vesuvius in 79 AD. Its layout was designed to make its spectacular sea views as much a feature of the house as its architecture. 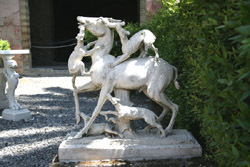 The house of the stags was excavated by Maiuri between 1929-1932. Its last owner was identified as one Q Granius Verus from the stamp on a loaf of bread found preserved in the house. The Granii were a family of successful merchants. Maiuri identified a large elite villa. The house appears to have been first built during the reign of either the Emperor Augustus or Claudius. It was completely remodelled not long before the 79 AD eruption of Vesuvius. The only original part of the house that remained was the atrium. The rest of the house was completely redesigned to link a series of interconnected rooms and spaces with the spectacular sea views the villa enjoyed.